Bugs in our favorite pastime have a much more ambiguous status in the halls of humor. Your 100-plus-hour save slot is irretrievably wiped by a firmware update? Not so funny. A character inexplicably contorts into the fifth step of the Kama Sutra Macarena? Exquisite. GoldenEye was a legend on the N64, singlehandedly shaking off Nintendo's "kiddy" reputation and opening the door for today's slew of split-screen FPS deathmatches. But what is any hero without a flaw? The A.I. 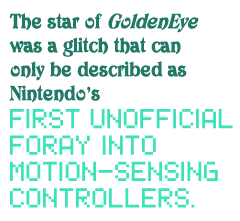 may have been idiotic at times, and clipping occasionally raised questions as to the corporealness of your characters, but the star of this show was a glitch that can only be described as Nintendo's first unofficial foray into motion-sensing controllers. The slightest tilt of the game cartridge sent onscreen characters (and, even more hilariously, vehicles) into a flailing, anatomy-defying spin. That these characters were going for the gold in ragdoll gymnastics was humorous enough, but a Japanese meme rocketed this glitch - like CATS's stirring ultimatum - into a new stratosphere of funny. Not even a classic 007 one-liner can top that. The mere implication of a glitch is cause for a laugh, as evidenced by Zelda II's overweight legend, Error. Once thought a genuine glitch, we now know his name owes more to shoddy translation than shoddy programming. But the suspicion that his moniker is the result of a developer's gaff still fuels his fame: Is there a hole in the programming? Is his name too beautiful for this world? Either way, Error was a pioneer in game humorology. Much has changed since the days when localization meant an unwarranted expense, voice acting was more gimmick than art and play-testing didn't require its own specialized team and months of work. That's not to say that these "problems" have been solved, but they've certainly been diminished. Does this mean that gamers will now turn over control of the play-to-laugh ratio to game designers? Hardly. Funny games will be made, yes; but gamers will remain ever vigilant, lampooning the stragglers while absorbing every comical nutrient they can find. Even if the Blazing Saddles of gaming is long in coming, no worries - we have plenty to amuse ourselves with in the meantime. Brett Staebell is aiming for freelance writer, but will also do freelance voice acting, guaranteed equal to or better than that of Chaos Wars! Enlist his services at defendership[at]gmail[dot]com.